All the bus shelters and outdoor advertising sites as well as all the posters in the town of Reading’s main shopping centre are to be NFC-enabled from 5 March, making it the first to be blanketed with NFC advertising. 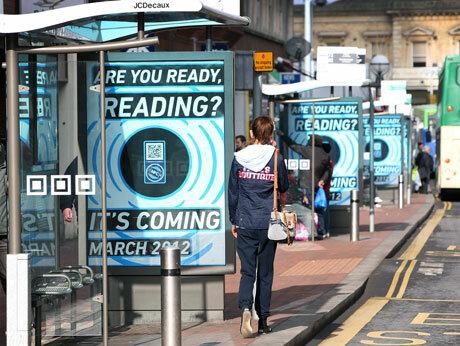 The town of Reading in the UK’s hi-tech M4 corridor is to become the first to have all its bus shelters and poster sites, as well as sites in the city’s Oracle shopping mall, converted to enable consumers to interact with advertisers via QR codes and NFC tags. In all, Reading will have 325 advertising ‘Touchpoints’ from which shoppers will be able to access exclusive video content from DVDs, preview TV shows, get discount vouchers and enter competitions. The project is being delivered by out-of-home advertising giant JCDecaux — which has already NFC-enabled 240 sites in Australia — in conjunction with outdoor media agency Kinetic Worldwide and technology provider Zappit.